Overgrown Path has been saying it for years - BBC Proms - a multicultural society?, BBC Proms 2006 lacks eternal feminine, Music gets in the way of running BBC Proms, and BBC Proms last night - I flee the country. Now other people are saying it - Hodge attacks Proms: they're narrow and lack the common British values: The culture minister, Margaret Hodge, will today criticise the Prom concerts as one of many British cultural events that fail to engender new common values or attract more than a narrow unrepresentative audience. At last people are finally waking up to the fact that the BBC Proms in their present form are outdated, irrelevant and unworthy of the BBC's marketing hype as 'the world's greatest music festival'. But government intervention will only make the situation worse, unless the cause of the problem is tackled. History is the key to understanding the present problems. The first Promenade Concert took place in 1895, and it was twenty-seven years later that the BBC became involved and broadcast the first concert. In 1945, exactly fifty years after the first Prom, the BBC took over as sole managers. The 1970s and 1980s were an Indian summer for the Proms with William Glock, Robert Ponsonby and John Drummond in charge, Pierre Boulez and Bruno Maderna were on the podium and The Soft Machine, Imrat Kahn, and David Munrow on stage. The problems started in John Drummond's reign and the writing was on the wall in 1990 when Last Night conductor Mark Elder was replaced at the last minute due to his dissenting views on the Gulf War. (It is interesting that Elder's reputation has grown has grown since then, while that of the Proms has declined). In 1996 Nicholas Kenyon succeeded Drummond as Proms director, starting a period when the broad music vision pioneered by Willliam Glock and others was subordinated to the marketing plans and ratings measurements of the post-John Birt BBC. To sum up Kenyon's twelve years as Proms director, which earned him a knighthood and another top job in the music establishment, I need only repeat my prophetic words written in February 2007 - His tenure at the Proms has been marked by unimaginative planning which totally failed to reflect the diversity of today's contemporary music, and his programming repeatedly backed personal hobbyhorses at the expense of important voices. The Proms will only start to reflect a broad musical and cultural vision when the stranglehold of BBC Radio 3 is broken. The joint position of Radio 3 controller and Proms director dates from the end of the Indian Summer in 1987 when John Drummond was appointed to both positions. Like Nicholas Kenyon, his successor Roger Wright now holds both positions. The joint responsibilities create a disastrous conflict of interests in which the 'day job' of network controller invariably takes precedence over the concerts. So everything else is subservient to the broadcast schedule, including the music and timings. To start the rejuvenation of the Proms the positions of Proms director and Radio 3 controller must be separated and 'Chinese walls' built between the broadcasts and the concerts. Birtian internal cross-charging should be instigated, with the Proms cost centre charged for the million of pounds of free BBC Radio 3 promotion it benefits from. This free promotional air time makes it very difficult to promote competitive, and broader, festivals in London during the Proms season. Can anyone really support a position where the BBC control the concerts, the promotional medium, the resident orchestra, the radio and TV coverage, the new music commissioning budget and more? That word more is an interesting one. With a few exceptions a government minister and a music blog have been the sole critics of the Proms' tunnel vision. Margaret Hodge's criticism is reported in the Guardian; surely that bastion of liberal journalism would be one of the concert series' most vocal critics? Well, the Guardian's chief music critic Tom Service is high profile and a smart guy. But he is also a BBC Radio 3 presenter, writes for BBC Music Magazine and contributed a chapter to the book seen in my header image. 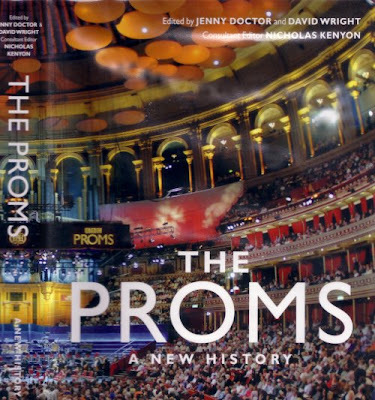 The Proms - A New History is a recent publication and the consultant editor is none other than Nicholas Kenyon. And yes, I've been an enthusiastic Promenader from the 1970s to the present day and I'm even linked from the BBC Proms website. I'm not sure I'd agree with her that Coronation Street and the Eden Project are more inclusive. Coincidentally we've just returned from the Eden Project and found it a rather politically-correct theme park with its acres of car parks and shopping mall. The danger of this type of speech is that it becomes an attack on quality, intellectualism and aspirations in the arts. But it is a good starting point to question the role of the Proms. And if the Proms had seen more intelligent programming and less hype and stunt-marketing by the BBC they would not be in the firing line. I'll tell you, if I had a festival with the kind of programming on a typical Proms schedule, I'd fall on my knees and thank [favorite deity here]. From my perspective in the SF Bay Area, the programming is superlative. Lisa, I think you would have found the programming at the 2007 Proms remarkably similar to the SF Bay area. It included a concert by the San Francisco Symphony - another touring orchestra and another war horse programme already trotted out in other European capitals. As I've said here before, I'm afraid I don't subscribe to the school of thought which says that because the quality is much worse elsewhere you should simply accept, without question, a lowering of quality aspirations. I'm afraid the BBC Proms have lost their way. Irrespective of what is, or is not, happening in the SF Bay area. I looked over the 2007 Proms schedule before posting my earlier comment. I'm usually interested in about one-third of what SFS performs. I would buy tickets to 90% of the Proms. The repertory is very different from what SFS programs. Things are worse elsewhere, which doesn't mean you shouldn't push for change at the Proms. By all means push for improvement at the Proms, but Margaret Hodge is not your friend. I can't see how any top-down reforms made today would not include more and more of those pernicious "marketing plans and ratings measurements". And how would the Proms be helped by having them promoted less heavily on the BBC? Ben, the current excellent South Bank Messiaen Festival, for instance, was not attacked by Margaret Hodge. Yet it is far narrower and more exclusive than the Proms. The reason it was not attacked was that it has not been subject to the remorseless empty hype and spin that the BBC apply to the Proms. The BBC has done itself no favours by claiming to run 'the world's greatest music festival'. But it has set itself up as a sitting target for the kind of criticism we have just seen, with it's jingoistic Last Night and its evening of Michael Ball. More promotion does not equal more merit or more diversity. There are many music festivals that do a fantastic job without the promotional resources of the BBC. At some point the classical music community will realise that big is not beautiful and that spin does not equal good. In today's press Gordon Brown describes the Proms as a 'wonderful, democratic and quintessentially British institution. Quite so. While Nicholas Kenyon defended the Proms with these words: 'There's no cultural event that's more opening, sicmore welcoming, more accessible.' Which neatly writes out of history a 2006 season that failed to include a single female composer. Almost everyone misses the point that the criticism wasn't about classical music per se, it was about making it more inclusive. Margaret Hodge hasn't attacked the South Bank Messiaen Festival because she doesn't know it exists, or if she does, she assumes her audience won't understand what she's talking about. Besides, she'd be worried about mispronouncing 'Messiaen'. The Proms, on the other hand, are known to practically everyone - if only as a caricature, so much the better for Hodge's axe-grinding. The problem for me living in Los Angeles is that there's really one game in town: the Los Angeles Philharmonic. I've been at the mercy of Esa-Pekka Salonen's programming decisions since the late 80's. Imagine my horror of going from "YES! He's a committed post-war avant-gardist! I'll finally get to hear Gruppen live! [which hasn't happened]" to "Oh. my. gawd. he's become a fan of minimalism. Freakin' California sun, it turns people's brain to mush!". And E-PS *loves* Peter Sellars work. Yikes.